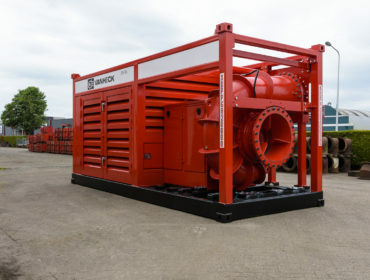 Van Heck develops largest mobile pump set in the world! After a complex development process, Van Heck’s engineers succeeded in building a pump set with an even larger flow and volume. The brand new diesel driven HK800, like Van Heck’s present pride, the HK700, has been built on 20ft container size. Where the HK700 can pump around 7,000 m³/hour, the HK800 will reach a flow rate of almost 10,000 m³/hour! This comes down to draining an Olympic swimming pool within 15 minutes. The HK800 is extremely suitable for dredging projects and calamities. If desired, this pump set can be supplied with sound reduction. The first HK800 has already been rented for a nice dredging project in Egypt. For more information about the HK800 please contact +31 (0) 561 431 739 or send an email to info@vanheckgroup.com. Home News Van Heck develops largest mobile pump set in the world!